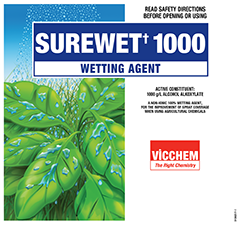 SUREWET 1000 is a 1000g/L (100% active) non-ionic wetting agent which can be used in a wide range of situations where a wetting agent is required. Typical use rate is in the range 40 – 100mL/100L for most foliar applications. Compatible with Crusader* and most other herbicides. Always follow directions on Surewet 1000 label and on the label of other agricultural products used. Enhances the uptake and efficacy of agricultural products. Improves droplet adhesion and wetting and spreading of spray droplets. 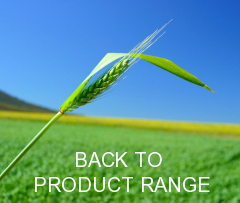 Is compatible with a wide range of agricultural products and uses.